Before dry bagged foods came to be, dogs were fed canned horse meat and table scraps. Due to the impending war and depression, things changed. The metal was needed for the war and we discovered that dogs could survive off of the waste from human food processing. Dogs have been scavenging, and eating meat and bone for thousands of years. Evolution shows that in that short amount of time, dog's digestive systems have not changed and they are still designed to eat and digest meat and bone. Feeding a biologically appropriate diet is quite common. In zoos across America, and the world, the animals are fed a diet which is as close as possible to what they would eat in the wild. It is detrimental to the animals health and well being to feed them anything else than what they are designed to thrive on. You won't see a captive lion being fed a dry processed food, so why do it to our pets? I choose to feed my dogs (and weaned puppies) a raw based diet. My personal reasoning behind this is as follows... I don't need to question what they are getting, because I choose the quality, and the sources. There are no fillers, no allergens, no processed foods, and their skin, coats, teeth, and overall health prove time and time again that this is what they are meant to eat. My dogs go to the vet once a year for wellness exams, and have a blood test run. I run full blood panels (CBC & Chemistry) on each dog to make sure they are getting the nutrients they need. Not every dog can eat raw food, because not every person has the availability to feed their dog a raw diet. It does take some work, knowledge, and time. I am constantly reading and learning more about food sources, and trying to find the best sources in my area. It does take some work. I am always asked questions about feeding my dogs raw. I will try to answer a few here. Why Do you feed your dogs a raw based diet? I kept hearing about dog food recalls, and started reading more about the poor quality of dry kibble and how it's processed. I also read about how the AAFCO is not very good at actually regulating dog food. This is what got me interested in canine nutrition, and in turn, feeding raw. I wanted my dogs to thrive, and eat a more biologically appropriate diet. I wanted them to have lean muscle mass with little fat. I wanted them to have clean teeth, and fewer visits to the vet. This is why I chose to feed raw. I have intermittently fed premium grain-free kibble for short periods of time, and I have always come right back to an all-raw diet for my dogs. Click HERE to read more about longevity being linked to kibble fed dogs, and why it doesn't really work out. Isn't it expensive to feed raw? If you like making multiple visits to your veterinarian every year, and you enjoy helping to put their kids through college, then please continue to feed a dry, bagged food. I have not done any dental cleanings on my dogs since 2006, when I started feeding raw. That's at least $400 per year per dog I'm saving. I would much rather spend that on the dogs nutrition. Aren't bones bad for dogs? COOKED bones are bad for dogs. RAW bones are softer and do not splinter like cooked bones. 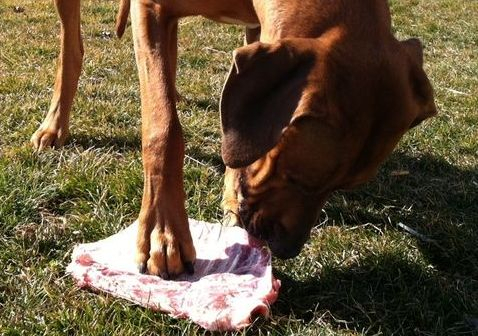 Raw bones are completely digestible by dogs. Haven't you ever noticed their molars and how they are shaped like a "V"? These are bone crushing teeth. Don't dogs choke on bones? Yes, dogs choke on COOKED splintered bones. More fatalities are caused from dogs scarfing their kibble down, because they are not chewing it in turn causing blockages or bloat. Haven't you ever seen your dog regurgitate after eating, and the pieces are still whole and un-chewed? With raw food, it forces them to chew their food. The chewing action also gets the digestive juices flowing, and by the time the food hits their stomach it is primed for proper digestion. What about salmonella poisoning or bacteria from meat? Salmonella mostly affects humans, not dogs. Dogs have a short, very acidic digestive system. They are able to digest many things that humans cannot, such as salmonella. How do I know this? Because 80% of all consumer poultry is affected with salmonella, so I'm pretty sure my dogs have digested it. When properly handled by humans, salmonella does not pose a risk. Doesn't feeding your dog raw meat make them mean? I always laugh at this one. This is a complete myth. There is no correlation between aggressive dogs, high prey drive, and a raw diet. If your dog is aggressive, please go to your vet and have a full panel thyroid test run. Isn't it time consuming to feed your dogs raw? It's only as complicated as you make it. I purchase most of the meat all at once, from the butcher, or grocery store, or farm store, and package it into plastic bags. I then throw it into the freezer. Every couple of days I pull out what I need to defrost in the fridge, and feed what's already been defrosted from the day before. It really doesn't take any more time than measuring kibble into a bowl. It can be complicated as I've heard of some people that portion out each meal ahead of time and measure ingredients into containers. I used to be that way, but learned to look at my dog and decide if they needed more or less. As long as there is plenty of variety in types of meats and you are adding organs, your dog will receive all the nutrients he needs to thrive. Doesn't your vet think that feeding raw is bad? My vet actually supports my decision to feed raw. My dogs are healthy and rarely have to see the vet. Veterinarians receive little education on canine nutrition. What they do receive, is typically training given by a dog food company. Vets often sell dog foods in their offices, receiving revenue and free food to sell in their practices. More or less the dog food companies and pharmaceutical companies are paying for veterinarians to graduate. In a word, they are promoting foods that are detrimental to pets health. Veterinarians are very highly qualified individuals... just not when it comes to your pet's nutrition. How long have you been feeding raw? I started feeding my dogs raw in 2006. How did you start feeding raw? It was pretty scary at first because I really was still in research mode, but I wanted to get started. I decided to start it cold turkey, so no kibble meals in between. The first thing I did was to get rid of all the kibble so that I wouldn't be tempted to go back to it. I then started my dog on cut up chicken wings after fasting her for a day. I'll be honest, the first day she looked at me like I was crazy. Whatever that was that I had put in her bowl, she was not going to eat. I didn't back down, I didn't feed her any treats between mealtimes, and I continued the next meal with the chicken wing pieces. She turned her nose up for two days. By the third day, she tried one or two pieces, and by day four she was gingerly eating them. She would take one, chew it up ever so slowly, and then swallow. After a week or so, I made the pieces bigger, then two weeks later began adding other meats and organs. After a month on raw, I couldn't believe the difference, in her coat, muscle tone, and energy level. It was amazing. She was like a whole new dog. What specifically do you feed your dogs? I feed a variety of meat including organs from: chicken, turkey, beef, lamb, pork, fish, venison, goat, and rabbit. I also feed organic raw eggs. Plus, anything else I can get my hands on. They receive a daily multi-vitamin, as well as a high quality salmon oil capsule for O3s. They do get occasional table scraps as well. 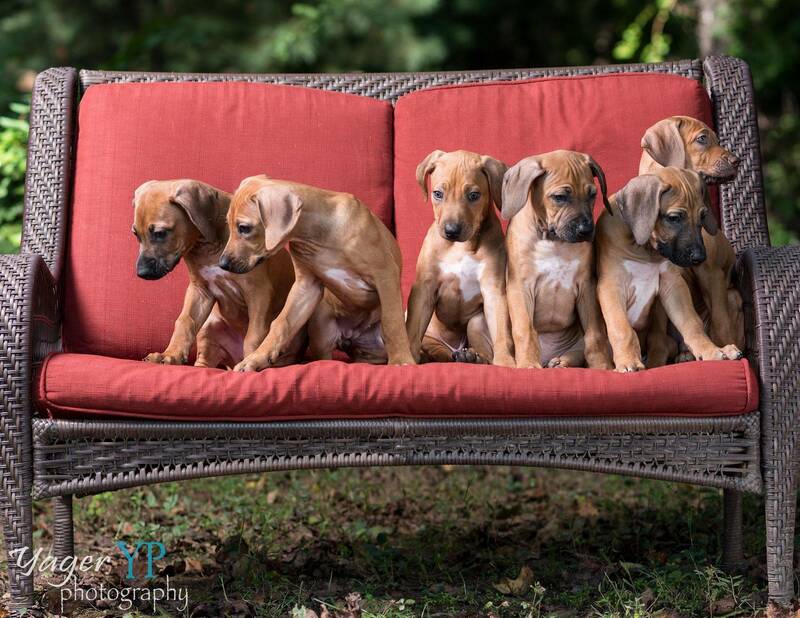 Puppies also get carbohydrates in the form of cooked oats or barley. Are there different types of Raw Feeding? Yes. I feed a combination of prey based and a franken-prey raw diet. Prey based consists of whole pieces of meat, bone, and organs. Franken-prey is cut up meat and ground meat. There are many pre-made raw diets available to the consumer, although they are a world better than kibble, they can be pricey and many add vegetables and grains. If you can't do the research to do a full raw, but want your pet to benefit from raw, possibly a ground pre-made diet is what you're looking for. I compare the processed nature of bagged dog food to human fast food. Yes, you can survive on it, and it will sustain your life; however you will not thrive on it, and if you eat it every day it can become detrimental to your health. Kibble = McDonald's. Studies prove that dry kibble will sustain your dog's life. Studies also prove that kibble is linked to cancer, gastrointestinal issues, and allergies. Several health problems are now linked to kibble fed dogs. Namely, periodontal gum disease. 70% of all kibble fed dogs have some sort of gum disease by the time they reach their second birthday. Since the introduction of kibble, there have been diseases that were nearly unheard of previous to its advent. Diabetes, cancers, bloat, and inflammatory bowel syndrome, are just a few. Please click here: Raw Feeding Tips and getting started. When starting out on raw, try to find the best sources that you can for meat. This will take some research, and may take some driving. In my area I have found two places that I have used. Galvinell Meat Company, 461 Ragan Rd, Conowingo, MD. Galvinell is a butcher shop. They process meat and sell cheeses, and other products. They sell chicken backs, leg quarters, and necks in 40lb boxes for less than a dollar per pound. However, the chickens are likely farm raised in enclosed structures. They are NOT RAISED FREE-RANGE. They also sell ground turkey, ground beef, and ground pork shoulder available in 1 pound tubes. They do have a ground "dog beef" blend as well that is not for human consumption, as well as an organ blend that is also ground. I prefer less processing for my dogs food so I try to steer clear of them. Galvinell is not my first choice for raw feeding, because of the lack of information on sources, and the processing... however it is still worlds better than feeding kibble. Rumbleway Farm, 592 McCauley Rd, Conowingo, MD. I Love Rumbleway Farm! I used Rumbleway Farm as my meat supplier when I lived in Pennsylvania, and I still continue to go there occasionally. All of the meat available at Rumbleway is grass-fed and free-range raised on site. The animals are living as they were intended to live, and are raised naturally... and not on a feed lot. Rumbleway offers beef, goat, chicken and turkey. They also seasonally have lamb, and you can call ahead for rabbit. Rumbleway will cost you a bit more than other sources, but it is the best, and worth every penny. They package their turkey and chicken into nice shrink wrapped packages. And it's already frozen, unless you go in on the weekend April-October, then you can get fresh chickens. They also have turkey and chicken organs available, as well as beef liver and heart. Their chicken legs and wings, as well as chicken backs are about a dollar per pound, so still reasonable. They have nice hours for the week and they are open on the weekend days as well. In the fall they also have a Farm Day where many people come out and they show you how the farm operates. They offer many types of animals, as well as hayrides, and stuff to do for the kids. Even just feeding raw meat of any source is better than kibble. You can frequently find turkey legs, wings, and necks at Wal-Mart or your local grocery store for a reasonable price. You can get 10lb bags of chicken leg quarters for less than a dollar per pound at Wal-Mart. Check your local grocery store for meats that are about to expire. Many times they will have thighs and leg quarters at a reduced price just before they expire. During hunting season, ask around and you will find many hunters who will give up parts and pieces that they will not use. Be sure to freeze any wild game for at least a week before feeding to your dog. Craigslist can be your best friend. I regularly submit an ad to see who's cleaning out their freezer. I have gotten some really good stuff by doing this, and have been able to feed my dogs for up to a month on meat that I have gotten for free. This will save you on cost as well in the long run. I really like Raw Feeding Miami. They do not sell pre-made diets that contain anything other than meat. They sell animal meat, bone and organs from grass fed, pasture raised animals. Their products come in vacuum sealed packages that are clearly labeled. Their shipping is reasonable and it gets to you in about a week. Their website is easy to navigate and their food arrives in a Styrofoam box packed in dry ice. I have never had a package come defrosted. The following are pre-made diets that have other ingredients added to their recipes. Read the packaging to make sure they do not contain allergens if you so decide to feed any of these. There are many other resources and forums on the web that can be found on yahoo and Facebook. Many folks can't go all raw for one reason or another, so they feed a cooked home prepared diet for their dog. This is much better for your dog than kibble as long as all nutritional needs are met. This will however require much more supplementation on your part. Remember that when food is cooked at high temperatures many of the valuable micro-nutrients and vitamins are cooked out of it. I try to review this page and keep it up to date as much as possible.